The year of 2013 proved to be a year members of the foundation will remember. We held 14 meetings through the year and have raised well over $100,000. Construction is well under way and the dedication date was moved ahead by one year. 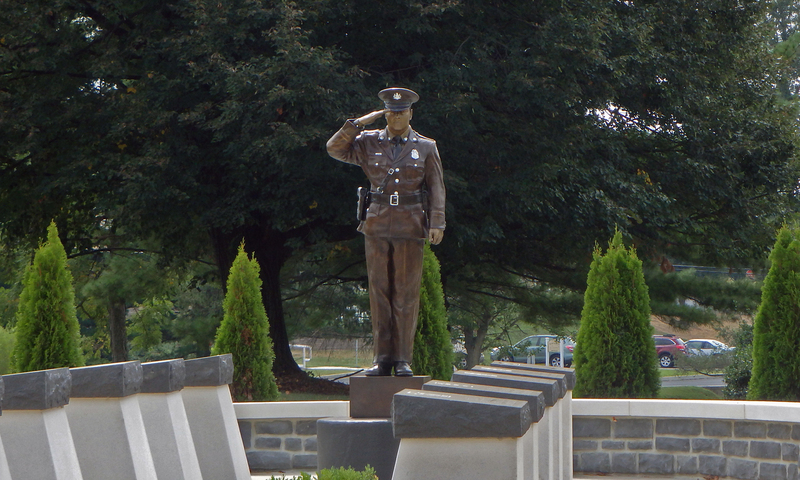 The Cumberland County Law Enforcement Memorial is quickly becoming a reality. February 1. The first meeting of 2013 showed the foundation with a cash balance of $16,538. It was decided we would consider selling engraved bricks to raise money. Discussion was also held regarding the final site plan, honor guard and the criteria for an officer to be memorialized by the CCLEMF. March 8. John Gleim is meeting with Brian Shifflet from Gannett Flemming. They will work together as we move to the construction phase. Flyer for brick sales was approved for printing and sales will begin. March 22. Gleim gave us some perspective as to some costs we will incur as building starts. Spangler contacted the Penn Cumberland Garden club about them possibly maintaining the memorial after it is complete. East Pennsboro Police purchased the first brick. Ground breaking discussions were started. March 28. With regret the foundation accepted the resignation of Ron Turo. Ron worked very hard for the foundation. Ron had professional matters to attend to; however he offered to continue to assist in any way possible. With the loss of Ron there was discussion about contacting John Gleim to fill the Board position. April 12. Gleim introduced us to Mike Smith, Mason, Joel Ramp, Landscaping and William Sweet, HVAC along with others from his team. These craftsmen have agreed to help build our memorial. Megan Silverstrim will set up Face Book and Twitter accounts for CCLEMF. Gleim was appointed to fill the empty board seat. Ground breaking was set for May 14. SA Terry Anderson will be memorialized in our memorial. Terry was SAC in Harrisburg when he was murdered thus making part of his primary jurisdiction Cumberland County. May 3. Don Mowery President of R.S. Mowery Contractors made his first appearance at a Board meeting. Mowery expressed interest in the memorial. He will contact Shifflet at Gannet and get more information. There were a lot of questions and not many answers. Megan is coordinating the grounding breaking for us next week. May 14. Ceremonial ground breaking was held. Giant foods presented us with a $25,000 donation. Spangler did a great job getting survivor family members to attend the ground breaking. The weather was beautiful. June 13. The meeting was held in West Pennsboro Park at their veteran’s memorial. Members of their memorial also attended. There was discussion regarding the pedestals, flag poles, stone facing and other construction concerns. Hammon reported he talked with 2 sculptors. Ecclestor is from NY who estimated the cost of a statue at $80,000. Becky Ault is from Lancaster the cost at $40,000. Farther discussions will take place on these items. July 11. Silverstrim is preparing various information releases for media and municipalities in an attempt to keep the CCLEMF name out there. Mike Smith, mason talked about the stone we should use and a stone was selected. Mowery had one of his estimators look at the plan. Estimated cost for the memorial was set at $290K. Mowery stated that he will donate $5000 cash to us and also make considerable in-kind donations. This was huge for the memorial. Megan S Silverstrim was appointed as Director of Public/Media Relations. This is a non-voting seat. August 8. An article will appear in a number of county magazines regarding the CCLEMF. Don Mowery has taken the lead in our construction planning. We are now projecting a completion date of May 2014. Mowery will provide us with a document regarding the build list. Information continues to be sent out. August 29. Mowery reported on his efforts to obtain in-kind donations of concrete, steel, block, cement, stone and other building materials. Gleim has lined up the mason, plumber, electrician and landscaper to do the work. Gleim wants to start work mid-September. Approval was given to order all granite to be used at the CCLEM. September 13. Mike Smith will donate all block and stone work. Joel Ramp will donate all landscaping and Bill sweet will donate all electrical work and supplies. Hammon and McLaughlin met with George Richards from ABC 27 News and asked them to produce a historical video and about the memorial and its eleven officers, ABC agreed. Silverstrim will organize a school contest for a quote to use on the inspiration wall. September 17. Hammon, McLaughlin, Anderson and Spangler traveled to Lancaster to meet with Becky Ault regarding the memorial statue. Ault provided us with a tour of her foundry and explained each step of the process. Ault gave us a price just under $40,000 for a full sized officer statue. October 18. Mowery updated us on construction plans. Pennsy, Hempt and Carlisle concrete have agreed to supply all necessary concrete and cement building materials, pro-bono. A contract for the statue with Becky Ault was signed. Our friend and former Board member, Ron Turo was appointed as the foundation solicitor. Contact was made at the West Shore Chamber of Commerce. They agreed to work with the 4 Chambers in the county to send a CCLEM mailer out to their members. Construction will start next week. October 22. Construction started and a month later all concrete and block is complete and the 3 flag poles have been set. December 13. This is the 30th meeting of CCLEMF since it was founded. We have raised over $95,000 in cash this year. Business for the year was closed. Construction is stopped for the winter months. Stone facing has been ordered by Mike Smith. Mowery is working to get the precast wall caps and pillars ordered. Caps and stone will be here when spring breaks. Spangler visited Becky Ault at the foundry. She indicates we are on line for the statue to be completed in May. Tentative dedication date for the memorial was set for May 9, 2014, one year ahead of our original date. Ron Turo one of our charter members left the board, however later he in year he was appointed as the Foundation solicitor. John Gleim introduced us to his build team. Megan Silverstrim took CCLEMF to social media through Face Book and Twitter. Don Mowery, President of R.S. Mowery Constructors expressed interest in helping us. Mowery estimators put a $295K price tag on the memorial. Articles in a number of County based magazines are printed. Megan Silverstrim appointed as Director of Public/Media Relations. ABC 27 agrees to do a historical video about the memorial. Contract for our statue is signed. Tentative date for dedication set for May 9, 2014. To date over $111,000 cash and an estimated $75,000+ in-kind has been donated.